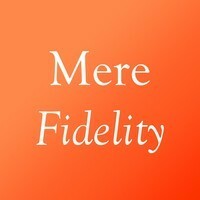 The latest episode of Mere Fidelity is a discussion of Dr Peter Enns’ recent book, The Bible Tells Me So. Andrew Wilson wrote a review of the book, to which Dr Enns responded, to which response Wilson later responded (Wilson has previously addressed some of Enns’ positions here). In the podcast, we take up some of the issues raised in Enns’ response to Wilson. This entry was posted in Audio, Bible, Controversies, Podcasts, Scripture, Theological. Bookmark the permalink.